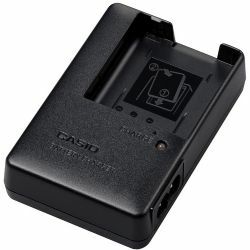 The Casio BC-110L Exilim Battery Charger provides a full charge for the Casio NP-110 battery in approximately 2 hours. The charger is simple to operate and includes an easy to see charging indicator lamp. It includes an AC power cord with U.S. plug and user guide, and weighs less than four ounces for easy portability.